Most people in Vermont have at least two or three jobs – it is just the nature of living in a rural part of the country. I am no exception. Certainly the N-News is my primary job and it takes up full time hours (sometimes more), but there are other things I do as well. My extended family has grown garlic for the past twenty years. We have a few small plots growing a total of eight to ten thousand heads every year. It is a labor-intensive crop since much of the work has to be done by hand. It brings in a little extra income, makes for some good family and friends time and keeps us in good supply of “the stinking rose” throughout the year. 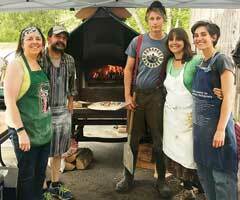 For the last three years, I have also been selling wood-fired pizzas, with support from friends and family. We go to a handful of private and public events over the summer. It isn’t a big money maker, but it is a lot of fun and very, very different from working in the office on a computer or in the garlic field. It is more social and interactive. The pizza gig came about when my wife and I were having a post-wedding party a few years ago. I started looking around for a pizza oven to rent, but found the prices to be incredibly steep. Being a “project guy,” I began to seriously consider building one myself. After doing some research, I remembered that a local gentleman had built a bunch of these ovens and had even written a book about it. I contacted Dan and he and I came to an agreement to build an oven together. It was a fun project and will certainly lead to other projects. The oven was a hit at our party, with many of our guests, kids and adults, enthusiastically joining the pizza-making fun. The pizza oven became a social center. After the party was over, I had this, funky oven-on-wheels to make pizza or bake bread. 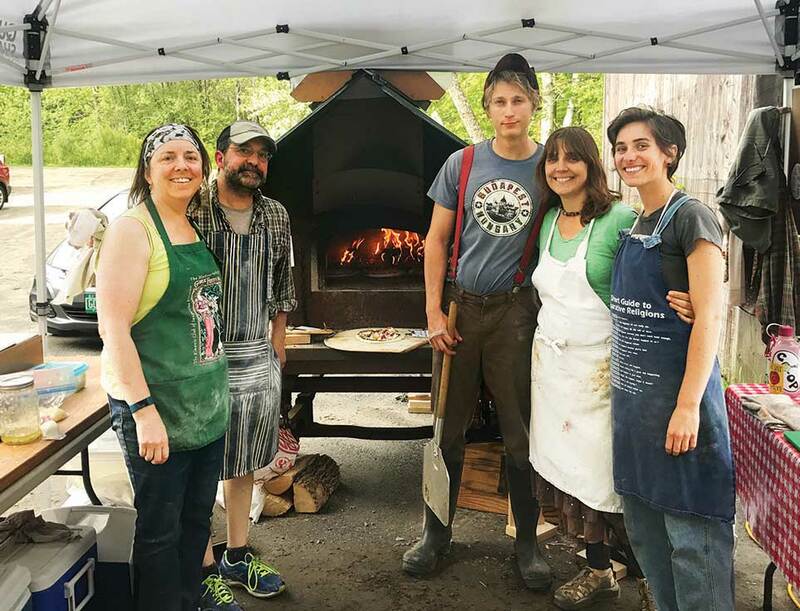 Before I knew it, the local non-profit ski slope asked if we could come over for an event and make pizza, a neighbor/friend asked if we could make pizza at her family reunion, and a local micro-brewery asked if we would be the food vendor for their first anniversary celebration. At a recent pizza gig, a young woman came up to order and asked if we took credit cards. “No, no cards – cash only, or you could write us a check.” She looked a little dejected. Her family didn’t have cash with them and the checkbook was at home. She started to walk away, so I said, “Hey, just drop a check in the mail when you get home.” She was surprised and pleased at this gesture of trust. Her family ordered a couple of personal pizzas and went on their way. Sure enough, a few days later I got a check in the mail for $16 and a note of thanks for making their day. I was reminded of the reason why I live in an area where people value community and relationships. Even if she hadn’t come through with sending payment, I don’t think I would have been too upset. My pizza business isn’t about making a killing; it is about being a bridge for celebration and making people happy. That makes me happy, too. This entry was posted in From the Publisher by N-News. Bookmark the permalink.